September in Los Angeles: it may not be the chilly, golden leafed coming-of-autumn our Midwestern and East Coast neighbors wax poetic about, but it is quite magical in its own right. The weather is still warm, the sunsets are still spectacular, and the tourist busses that clog up roads during summertime run less frequently. Most importantly, the end of summer is a glorious time for golden hour best spent on a patio with a glass of wine in hand. Here are our six favorite restaurant patios to celebrate this lovely, ephemeral time in between seasons. A timeless classic for a reason, the Polo Lounge at the Beverly Hills Hotel feels like its own little world. A secluded booth and a bottle of Champagne complete this swanky, romantically retro escape from reality. For a slightly more casual but equally chic experience, check out the poolside bar. 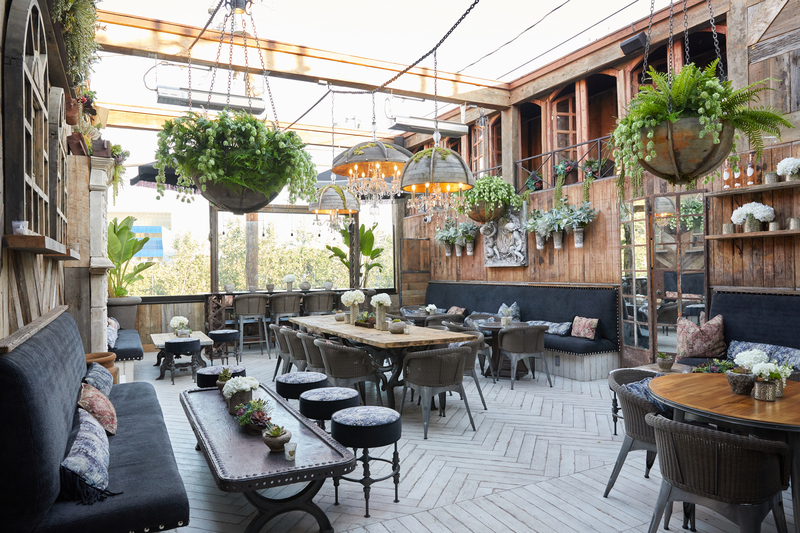 Perched atop the Century City mall, this sprawling rooftop establishment delivers scenic views and comfortable seating. Take in the sunset with a charcuterie board and a bottle of Barolo (or two!) to complete the Eat-alian experience. Braving the creaky, ancient elevators that transport you to the 15th floor of this 1920s building may require a nerve-soothing martini once at the top. However, the dramatic location nestled in between the skyscrapers of Downtown LA is worth it. This gorgeous industrial-chic venue has a striking interior, but the outdoor patio lives up to its nickname as the “hanging gardens of West Hollywood.” Lush decor, floral installations on the walls, and a view overlooking the neighborhood parks make for an unbeatable place to relax and indulge in one of TomTom’s high-concept cocktails. Unassuming from the street, celebrity chef Scott Conant’s newest venture is decidedly gorgeous and stylish on the inside… and the outside patio. Tables surround the piece de resistance, a bona fide giant tree that is elevated onto a pedestal and swoops its branches over diners. Hotspots in Los Angeles change faster than the seasons – here in the spring, gone in the summer – but Ysabel seems here to stay. With its combination of unconventional decor (stairs as seating? sure! ), great food and creative cocktails, this trendy locale looks to be more than a passing fad.